Rasmussen, Dorothy A. 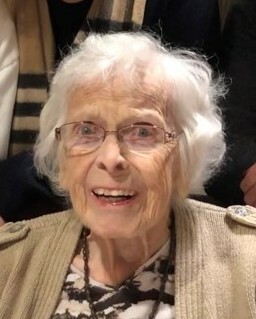 (Nee Radmer) Passed away with her loving family at her side on Sunday, January 20, 2019 at the age of 98. Dorothy was preceded in death by her loving and devoted husband, Carl P. "Rayne" Rasmussen; son-in-law Robert “Bob” Lehmkuhl; grandson, John Lehmkuhl. She will be deeply missed by her loving children Kristin Lehmkuhl, Lynn (Gary) Schutt, Kathleen (Peter) Hoppe and Robert Rasmussen; eleven cherished grandchildren and thirteen cherished great grandchildren. Grandchildren are Michael Lehmkuhl (Heidi Frist), Gregory Lehmkuhl (Jay Lassiter), Sarah Hyde (Derek), Andy Schutt (Kirsten), Doug Schutt (Amanda Handley), Kathryn Schutt, Charlie Hoppe (Janet Lee), Adam Hoppe (Maria Bninski), Christopher Rasmussen (Stephanie) and Adrian Rasmussen. Great grandchildren are Tommy, Joey and Katie Hyde, Noah and Ryan Schutt, Olivia and Jack Schutt, Sam and Max Hoppe, Rosalie and Elise Hoppe, Ian and Parker Rasmussen. Dororthy will be deeply missed by all of her many friends. Visitation will be held on Friday, January 25, 2019 from 1:00 pm until the 2:00 pm Mass of Christian Burial at St. Camillus, Our Lady of Guadalupe Chapel, 10201 W. Wisconsin Ave., Wauwatosa, WI 53226. Donations to Elmbrook Historical Society, PO Box 292, Brookfield 53008 appreciated.